I have this thing for fall collecting...fallen bits or remnants from a boisterous summer season. It's me preparing for the winter. I was just thinking this week I needed to make sure I had my fish oil handy to begin again, as well as my extra vitamin D. It's time to get out the light box and start using that in the early morning hours. These things I do to fend off the funk I can develop in Portland's dark, grey winter days that seem so short and hang heavy with darkness. See how I used "dark" twice in that sentence? I'm not overdoing it. This California girl has coping mechanisms for our winters, and they include the things I've listed here, along with making sure I have lots of interactions with good friends and a trip to somewhere warm planned for February. So back to bringing the outdoors in....that's part of my preparation too. I suppose I'm a little bit like those pesky squirrels scampering about scavenging nuts and stashing them in places to get to during the winter. I need my bits of the garden stashed about my house to remind me there is beauty out there in that wet, cold, drenched landscape. So here are two projects for you, ones we talk about on the most recent Lelo Homemade, in an episode all about ways to decorate your home for the season, using elements from nature and the bounty of the harvest, with no sign of a giant inflatable cornucopia plugged into your front lawn to be seen. 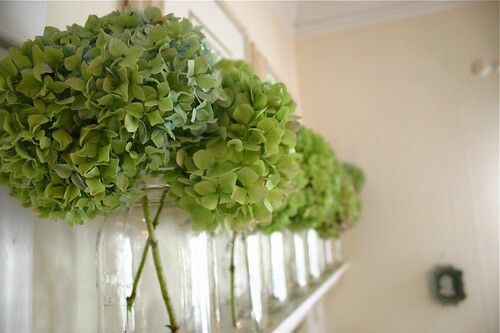 I like to use my jars to also hold dried blooms, and here it's with my all-time garden favorites, hydrangeas. Late in the season my bright Niko Blue hydrangeas begin to turn green, then pink. I like to get them when they're green but maybe holding hints of the blue and edges of the pink yet to come. No fancy arranging needed. They do well simple left in the jar to dry, and if kept out of the way, will last for a good year or so. At the holidays I love weaving little white lights around these jars, bringing out a little sparkle but not too much glitz. The key here is simple repetition. Picking one bloom and using it in lots of repetition. Last year we took out a good-sized bay leaf tree to make way for a new back patio and arbor. Alas, it was the wrong tree in the wrong place, but I couldn't stand to see all those beautiful bay leaf branches hauled off to a chipper. 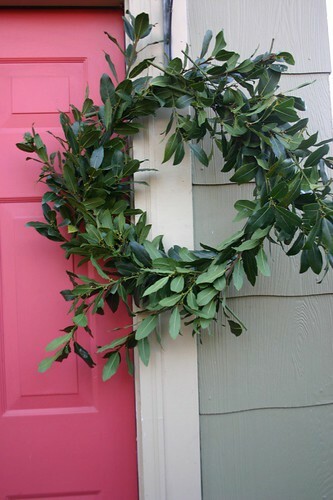 I spent an afternoon trimming manageable and pliable branches, then wrapping and wiring them to simple wreath forms using very few tools or materials. Nothing fancy, but lovely elements of nature were dropped off for friends and hung on our wall throughout the winter. And they smelled lovely. Need some more ideas? Listen in to the latest Lelo Homemade here, and I'd love to hear how you prepare your nest for winter. Love some good moss? Rock collection? Twig fanatic? Let me know....in the meantime, squirrel away my friends. I hear this winter is going to be long and wet. I like the idea of the little twinkling lights among those hydrangeas! 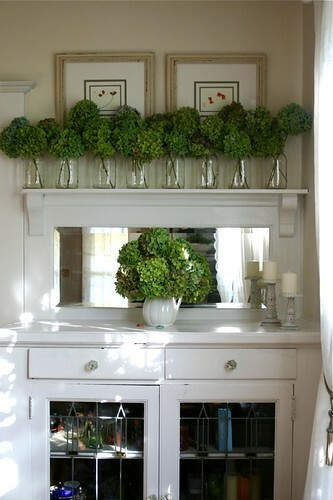 Am so jealous of your beautiful hydrangea arrangement! Seven years ago, I rescued a beautiful kitty who quickly became king of the house. I quickly rethought the rescue when I found that Trooper eats anything green ... alive, dried, or fake. I have so missed flower arrangements, plants, and lovely still lifes like this. But his love is worth it. Thanks for letting me live vicariously through your photos. just love it! thanks so much for the inspiration. I love me some GREEN from the yard! The hydrangeas are beautiful and unexpected in their green-ness. Very lovely. Wow. Stunning, stunning, stunning green fade on those hydrangeas. I totally procrastinated cutting any of my hydrangeas and not it's too late. Gorgeous! I love this. Thanks for sharing! !